What Marks The Origin and Insertion of Brachialis Muscle? Which Actions Do The Brachialis Muscle Performs? The Brachialis muscle is a muscle of the upper arm which lies much deeper than the biceps brachii muscle. It is a long and strong muscle which helps in the movement of the elbow joint. The brachialis muscle forms the floor of the cubital fossa. The origin of brachialis muscle is from the front of the lower half of the shaft of the humerus bone. When we view it superiorly the origin of brachialis embraces the insertion of the deltoid muscle. The brachialis muscle is inserted into the anterior surface of the coronoid process of ulna involving tuberosity of ulna. The Brachialis muscle is fairly broad and lies under the biceps brachii muscle in the front of the elbow. It can be seen just on the outside of the upper arm near the elbow. The narrow viewable portion of the brachialis muscle passes obliquely down and forward, first in between the biceps and triceps and after that in between the biceps and brachioradialis. Its obliquity increases as the elbow is bent, it likewise ends up being shorter and rounder throughout elbow flexion, looking like an oval relief on the outside of the arm at complete flexion. The brachialis rests on and includes muscular fullness to the front of the lower half of the humerus. Its front surface is rather flattened to get the flattened posterior surface of the biceps. The fibers at the upper outer end of the brachialis mix straight with a few of the inserting fibers of the deltoid. A depression might appear at this fusion. On the inside of the arm, the brachialis is hidden by nerves, arteries, veins, and specifically fat. When the elbow is partly bent and the muscles tensed, this area looks like a flat plane, surrounded in front by the biceps and the raised medial edge of the bicipital aponeurosis and behind by the medial head of the triceps. The brachialis might sometimes be seen in this area as a recessed bulge, however, it is constantly covered by blood vessels and fat that safeguards these vessels. When the elbow is totally extended, this portion of the brachialis is pushed forward at the elbow joint by the underlying trochlea of the humerus. It is still not seen individually; nevertheless, this area ends up being fuller as it is pushed forward. The brachialis crosses the elbow joint anteriorly (with its fibers running vertically in the sagittal plane); for that reason it bends the forearm at the elbow joint. 2. Although the biceps brachii is much better understood for bending the elbow joint, the brachialis is really the prime mover (most powerful mover) of flexion of the elbow joint. 3. The brachialis is particularly engaged with elbow joint flexion if the forearm is totally pronated (due to the fact that the biceps brachii and brachioradialis would supinate a completely pronated forearm apart from bending it). Because of this, the brachialis is finest engaged and palpated by asking the customer to bend the forearm when it is completely pronated. If the forearm is fixed, the brachialis pulls the anterior surface of the arm towards the anterior surface of the forearm. This action is flexion of the arm at the elbow joint. The reverse action of flexion of the arm at the elbow joint is very essential and happens whenever an individual understands a stationary thing and pulls his/her body towards it. Examples consist of making use of a handicap bar or using a handrail when moving upstairs. Restraining/slowing extension of the forearm at the elbow joint is very crucial when lowering a thing in a mindful and controlled way. 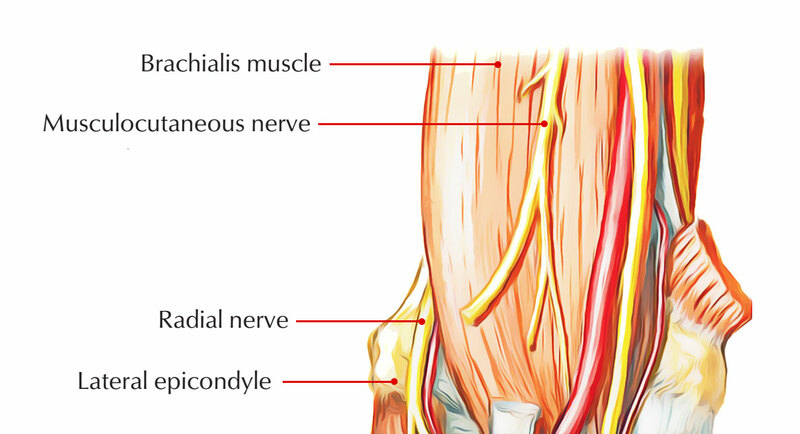 Medial two-third of the brachialis muscle is innervated by the musculocutaneous nerve. Lateral one-third of the brachialis muscle is innervated by the radial nerve. Although the majority of the brachialis is deep to the biceps brachii, the lateral margin of the brachialis is superficial in between the biceps brachii and the triceps brachii. More distally, the brachialis is superficial on each side of the biceps brachii’s distal tendon. Deep to the brachialis is the shaft of the humerus. The proximal attachment of the brachialis types a V shape and surrounds the distal attachment of the deltoid. On the lateral side, the triceps brachii is posterior to the brachialis proximally; the brachioradialis is posterior to the brachialis distally. 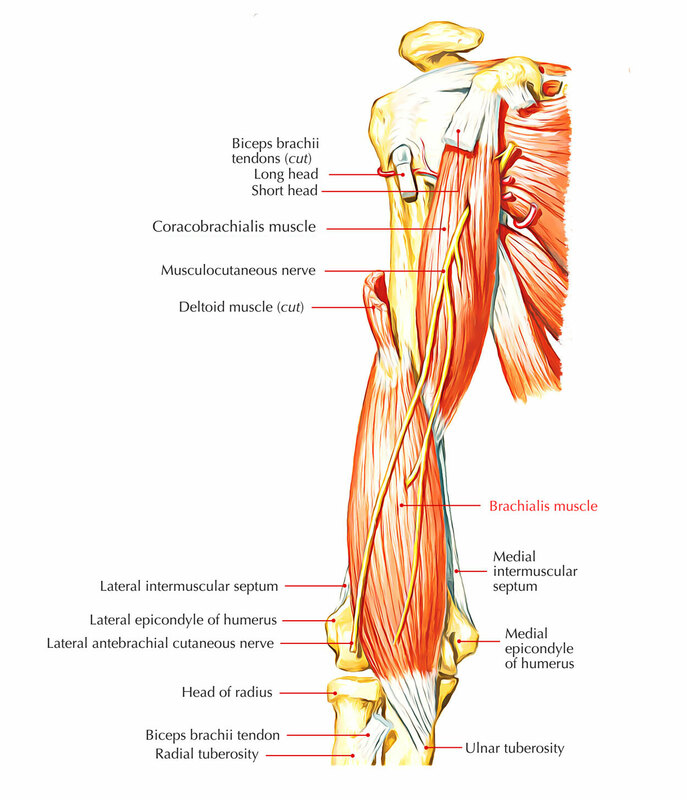 On the medial side, the triceps brachii is posterior to the brachialis. The brachialis lies within the deep front arm line myofascial meridian. In cases of a severe strain of the elbow, inflammation of the brachialis tendon (brachialis tendonitis) or injuries of the joint capsule frequently happen. A lot of pull-ups, extreme tennis practice or other unsuitable strain of the elbow are amongst the typical causes. As climbers are frequently impacted by this condition, it is clinically likewise described as the “climber’s elbow”. The traditional symptoms consist of swelling, soreness in addition to limited and uncomfortable movements of the elbow.